There is a stunning Grade II listed 17th century threshing barn, that has been very carefully restored, which houses display on different aspects of farming such as root crops, cereals and fruit growing. 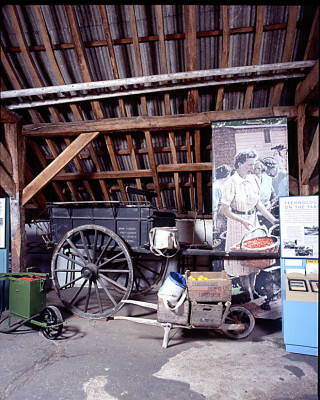 One of the key attractions in the stone barn is the Bassingbourn Plough. This very old wooden plough comes from Bassingbourn, where it ended its life there in the church tower! A lot depended on a farmer managing to plough his fields in time for sowing, so ploughs were sometimes taken into churches to be blessed in a special church service. For some reason, this plough had been taken up into the church tower, where it remained for many years. The beam was sawn off, perhaps in order to get it up into the tower, so you have to imagine how it would have looked. It was suggested in 1899 in a local publication (The East Anglian), that this plough should be handed over to a CountyMuseum. This came to be in 1999 when the plough came to reside here at the Farmland Museum. We do not know exactly how old this plough is, but compare it with the other wooden plough in the stone barn to see the differences.